3 on Horsefly River and 2 on Moffat Creek. 5 locations. Pack a lunch, enjoy the scenery. Get ready for an authentic wilderness experience! 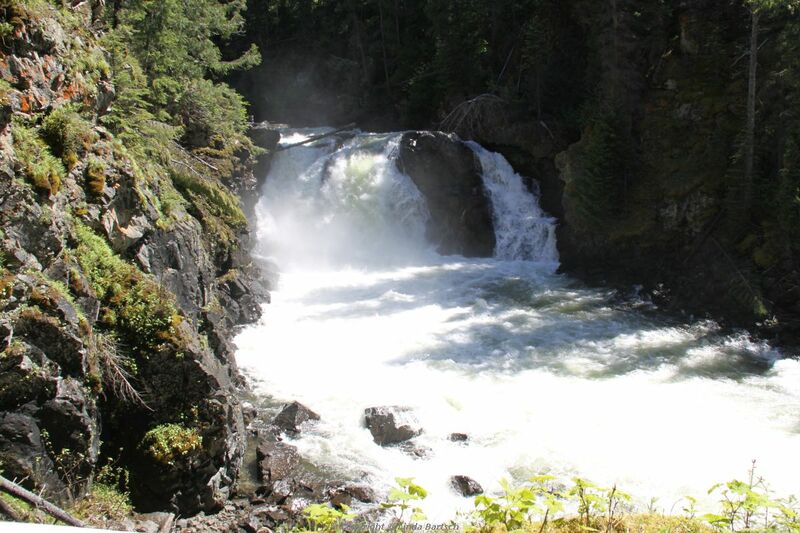 You will not find safety barriers or cell phone service at these breathtaking falls. To be prepared for this adventure, it is recommended that you have a 4 x 4 vehicle as you will be traveling on active logging roads. It is also recommended that you be Bear Aware, wear sturdy hiking footwear, and have mosquito repellant. The trails are rough, rocky and sometimes steep, but they are worth the effort! Start at Horsefly Bridge, cross and drive to the first intersection, by the sawmill, turn right on the Black Creek Road, also known as 100 Road. There are km distance signs all the way along – watch for those. There is a junction at km 126, stay left on 100 Road. 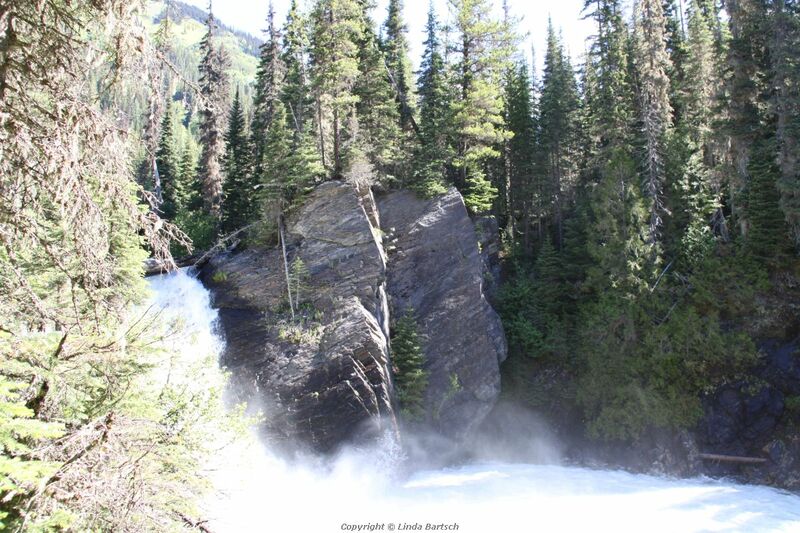 At km 129 you will see the sign Horsefly Falls. You can drive in the little road and park in the clearing. Follow the yellow ribbons to the top and bottom of the falls. It is mildly strenuous hike to the bottom less than a km. Be extremely careful – the rocks are slippery and there are no safety barriers. Continue on 100 Road, you will come to an intersection at km 145 – stay left. Falls is at km 145.5. 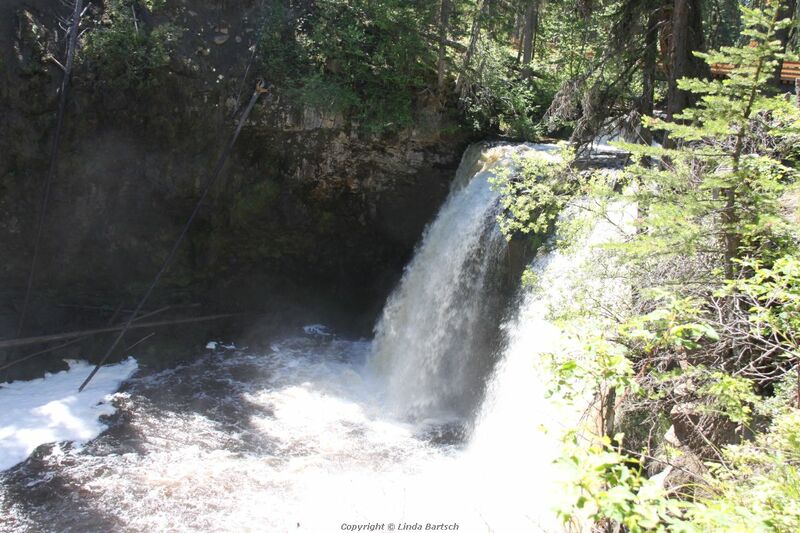 This falls is the closest to the road and a pretty easy hike. Continue on 100 Road, to km 149.5 at the junction with 900 Road. Park here and walk to the falls. You will see Big Slide Mountain towering above you on the left. Follow the yellow ribbons. This is also a mildly strenuous hike on rocky, slippery ground, so be careful. Go back into Horsefly village. Find the Horsefly Motel (across the road from the Pub) Turn on to Lowden Road and drive to the cattle guard. Cross the cattle guard – you are now on 108 Road. At this point set your km gauge in your vehicle. Drive 5.3 km. You will cross a cattle guard at about 5 km. Turn into the small road on your left. Park in the clearing. 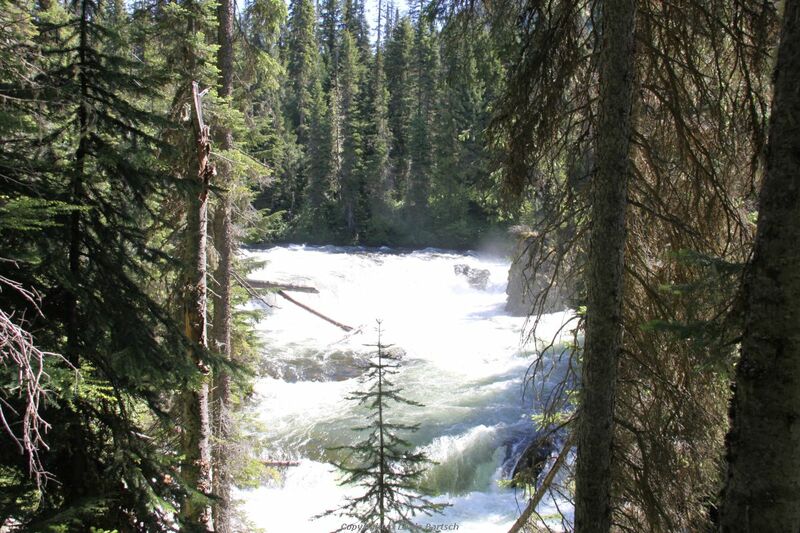 There is a picnic site with a stunning view of Moffat Creek and the Cariboo Mountains on your left. Follow the yellow ribbons to the falls – there are two view points – 1 above (be extremely careful – massive drop off) and one at the bottom. At low water you can see an old mine shaft down there. Fairly strenuous hike. Continue on 108 Road for another 2 km, you will see the sign, on the left for Moffat Falls. There is also a sign the says GST (Goldrush Snowmobile Trail). Take the little road and park in the clearing. On the way in you will see the ancient Chinese Oven and the hand dug ditch both dating back to the gold rush in the 1860’s. Walk into waterfall (easy hike). Walk along to the bridge over the river. Once again – be extremely careful – it is a steep drop off. When you have completed the Horsefly Waterfall Quest you have an accomplishment something you can be proud of. 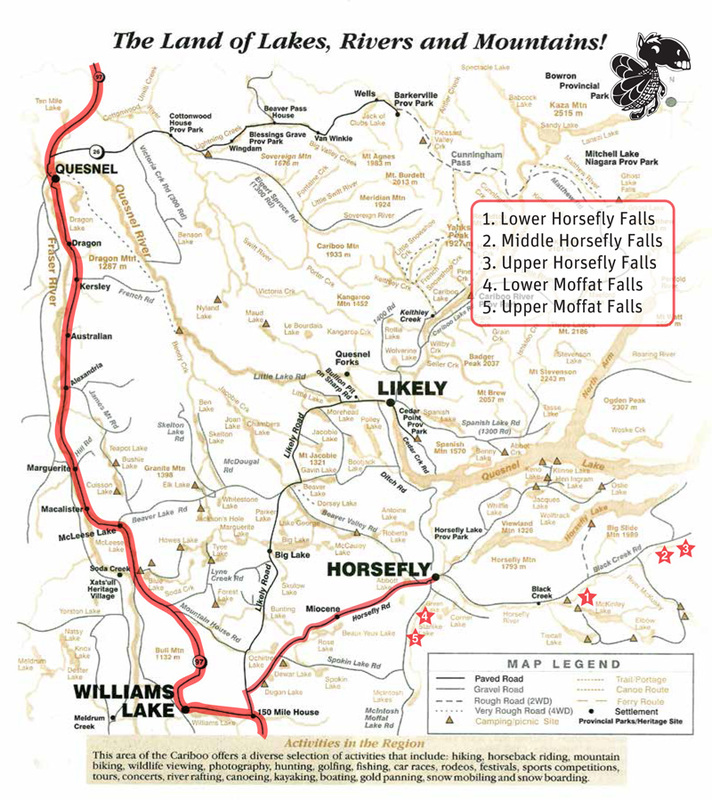 All the information about the Horsefly Waterfall Quest are also available as brochure in PDF format. Download the brochure and take it with you on your trip. Make it an activity for the summer of 2017 – Enjoy!